First large-scale study finds topography of cerebral cortex differs with ancestral genetics. Researchers at the University of California, San Diego have found that the three-dimensional shape of the cerebral cortex, the wrinkled outer layer of the brain controlling many functions of thinking and sensation, strongly correlates with ancestral background. The team state that the findings open the door to more precise studies of brain anatomy going forward and could eventually lead to more precision medicine approaches for diagnosing and treating brain diseases. They go on to add that if the medical community can account for a large percentage of brain structure based on an individual’s genes, they’re in a better position to detect smaller variations in the brain that might be important in understanding disease or developmental issues. The opensource study published in the journal Current Biology. In the current study the researchers found they could predict with a relatively high degree of accuracy an individual’s genetic ancestry based on the geometry of their cerebral cortex. The data findings found no relationship between brain shape and functional or cognitive abilities. However, it did uncover a trove of information about how minute differences in brain geometry could be correlated with genetic lineage. The results showed that the geometry of the brain’s cortical surface contains rich information about ancestry. 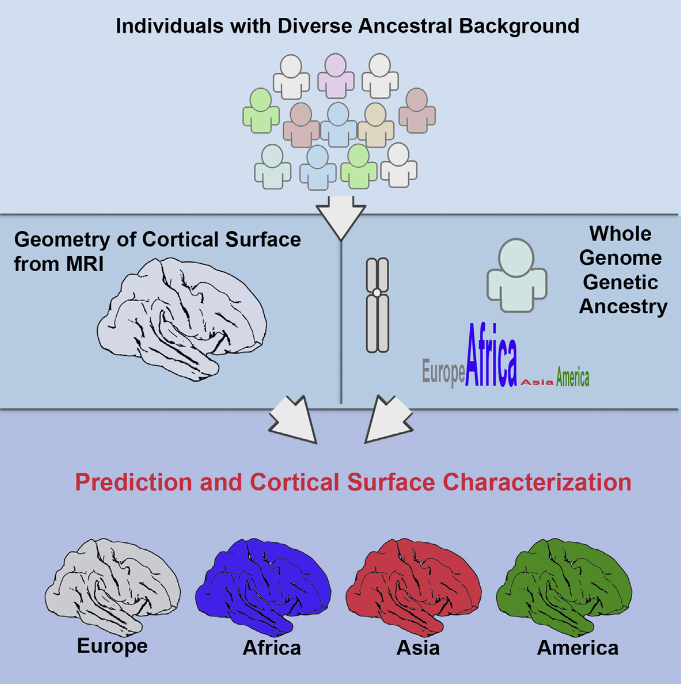 Even in the modern contemporary U.S. population, with its melting pot of different cultures, it was still possible to correlate brain cortex structure to ancestral background state the team. In the current study four continental populations were used as ancestral references, European, West African, East Asian and Native American. The metrics for summarizing genetic ancestry in each ancestral component were standardized as proportions ranging from 0 to 100 percent. The researchers looked to see how well they could predict how much genetic ancestry they had from Africa, Europe and so forth. The findings showed that there were various systematic differences, particularly in the folding and gyrification patterns of the cortex. The team note that those patterns were quite strongly reflective of genetic ancestry with the cortical patterns accounting for 47 to 66 percent of the variation among individuals in their genetic ancestry, depending on the ancestral lineage. The current study analyzed data from the Pediatric Imaging, Neurocognition and Genetics (PING) study, a major data collection project funded by the National Institute on Drug Abuse and the National Institute of Child Health and Human Development in 2009. The project collected neuroimaging and genotyping data from more than 1,200 children and adolescents at 10 sites in the United States to create a data repository to advance research efforts worldwide. UC San Diego was the coordinating center for the PING study. The team used a subset of PING data for the brain cortex study, analyzing genetic and neuroimaging information from 562 children aged 12 years and older, a group chosen because the cortex surface changes little after age 12. First, the genetic data for each of the individual children was analyzed to determine their different ancestral lineages. Next, the researchers took the children’s neuroimaging scans and analyzed them using a sophisticated brain imaging analysis software suite, known as FreeSurfer, originally developed by Dale and colleagues at UC San Diego in 1993 and now widely used by the research community. The software used quantitative modeling and algorithms to map the shape of the cerebral cortex. The results were compared to the individuals’ genetic data and patterns linked to genetic lineage emerged. The researchers state that there was a lot of variability in the participant population. They go on to explain that the children’s genetic results ran along a continuum, where a child might be 40 percent one lineage and 60 percent another. Overall the results show that the differences in cortex shapes between the various ancestries are subtle and systematic. The researchers state that understanding these differences will be important in refining future brain research and also in creating appropriate standards of comparison for the various ancestral groups, and for those which are a mixture of different groups. The team state that in order to understand what might be abnormal for a particular individual, it is very important to control for the differences in brain structure that are simply reflective of genetic ancestry. They go on to surmise that there is a need to develop better genetically informed analysis for detecting abnormalities in the brain and for measuring differences in the brain that might account for disease symptoms. The researchers concluded that this study is a step in the right direction and has implications for how people conduct brain research going forward. Knowing how the human brain is shaped by migration and admixture is a critical step in studying human evolution [ 1, 2 ], as well as in preventing the bias of hidden population structure in brain research [ 3, 4 ]. Yet, the neuroanatomical differences engendered by population history are still poorly understood. Most of the inference relies on craniometric measurements, because morphology of the brain is presumed to be the neurocranium’s main shaping force before bones are fused and ossified [ 5 ]. Although studies have shown that the shape variations of cranial bones are consistent with population history [ 6–8 ], it is unknown how much human ancestry information is retained by the human cortical surface. In our group’s previous study, we found that area measures of cortical surface and total brain volumes of individuals of European descent in the United States correlate significantly with their ancestral geographic locations in Europe [ 9 ]. Here, we demonstrate that the three-dimensional geometry of cortical surface is highly predictive of individuals’ genetic ancestry in West Africa, Europe, East Asia, and America, even though their genetic background has been shaped by multiple waves of migratory and admixture events. The geometry of the cortical surface contains richer information about ancestry than the areal variability of the cortical surface, independent of total brain volumes. Besides explaining more ancestry variance than other brain imaging measurements, the 3D geometry of the cortical surface further characterizes distinct regional patterns in the folding and gyrification of the human brain associated with each ancestral lineage. Modeling the 3D Geometry of the Cortical Surface with Genetic Ancestry. Dale et al 2015.